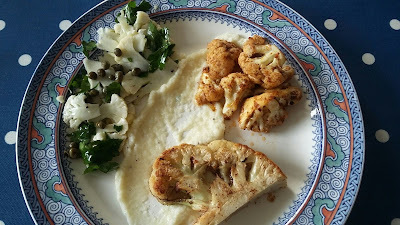 Notes from Ladysmock Cottage: Cauliflower Four Ways. This is a wonderful starter, but each of these ways of cooking cauliflower would work as a starter or side in their own right. Get a whole cauliflower, strip off the leaves (you could take the leaves off the stalks and wilt them down for an extra element to the dish), cut the stalk off so the flower sits on a chopping board. Cut a 2cm wide strip right through the middle of the cauli - this is your steak. Set a side for cooking later. team for 5mins until par cooked. Leave to cool. Finely slice the larger florets - you should get a good three or four slices from the centre of the florets. Dress them with white balsamic and some good oil. Add capers and and some chopped parsley. Leave to marinade. Gather together all the off cuts and left over cauli and place in a saucepan with a little slightly salted water. Boil for a few mins until the cauli is cooked through and drain off the cooking liquid. Add grated parmesan and blitz until smooth - return to the pan and keep warm. Make a spice mix by crushing a teaspoon of coriander seeds, a tea spoon of cumin seeds, a quarter of a tea spoon of celery seeds, 3 or 4 pepper corns, a quarter of a tea spoon of fennel seeds, a dash of cayenne pepper (or dried chilli flakes) and a dash of celery salt in a mortar and pestle (your spice mix can be all or some of these or different spices of your choice). To cook the cauli steak pre heat the oven to 180 degrees. Melt a knob of butter in a oven proof pan and fry the steak on one side until coloured. Flip it over and put in the oven for 10/12mins or until it is soft, but retains its shape. Meanwhile in a small saucepan heat some oil. Toss the steamed florets in the oil until coated the add the spice mix and cook until crispy on the outside. Plate up the warm puree, serving the spiced, roasted steak and cauli salad around it. Asparagus, Pea and Parsley Soup.